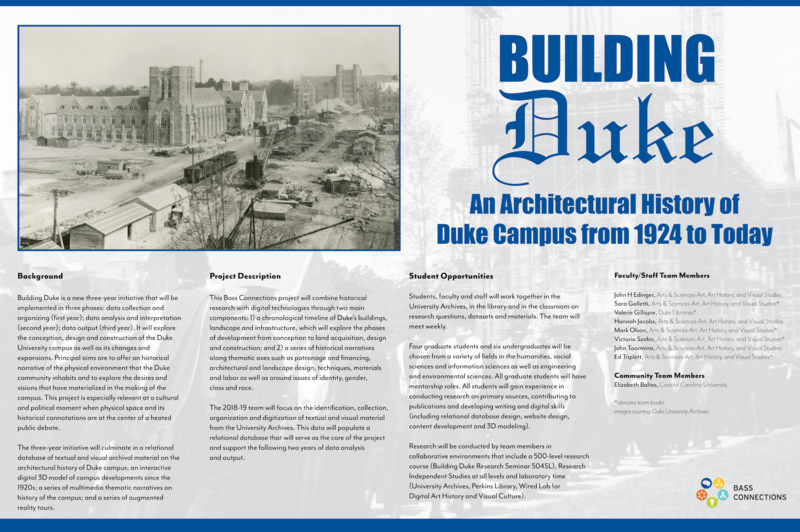 The project, set to begin in the 2018-19 academic year, is part of a new three-year initiative that will explore the conception, design, and construction of the Duke University campus as well as its changes and expansions. The Bass Connections project will combine historical research with digital technologies to develop a chronology of Duke’s buildings, landscape, and infrastructure from conception to land acquisition, design, and construction. The project will also produce a series of thematic narratives that explore patronage and financing, materials and labor, architectural and landscape design techniques, and issues of identity, gender, class, and race. The 2018-19 team will focus on the identification, collection, organization, and digitization of textual and visual material from the University Archives. This data will be structured in a relational database that will serve as the project’s core and support the following two years of data analysis and output. Building Duke will intersect with Digital Durham, adopting the model of some of the digital tools developed by Digital Durham and will expand upon the Statues Speak project to incorporate a broader range of sculpted works across campus. Four graduate students and six undergraduates will be chosen from a variety of fields across the university to conduct primary source research, contribute to publications, and develop written and digital skills including database design, website design, content management, and 3D modeling. Graduate students will have the opportunity to serve as project manager, graduate assistants, or instructional assistants.